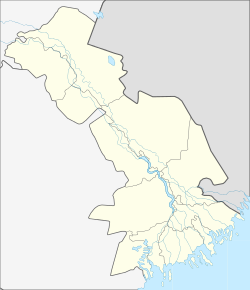 Astrakhan (Roushie: Астрахань) is a major ceety in soothren European Roushie an the admeenistrative center o Astrakhan Oblast. The ceety lies on twa banks o the Volga River, close tae whaur it discharges intae the Caspian Sea at an altitude o 28 meters (92 ft) ablo sea level. Population: 520,339 (2010 Census); 504,501 (2002 Census); 509,210 (1989 Census). ↑ Энциклопедия Города России. Moscow: Большая Российская Энциклопедия. 2003. p. 28. ISBN 5-7107-7399-9. ↑ Курбатов А. А. История Астраханского края (с древнейших времён до конца XIX века): Монография.-: Астрахань, 2007.- 184с. ↑ David M. Herzenhorn (April 10, 2012). "Moscow Protesters Try to Expand Movement". The New York Times. Retrieved April 11, 2012. This page wis last eeditit on 8 Mairch 2018, at 06:36.